A sentinel lymph node (SLN) is the first lymph node or group of nodes to receive lymphatic drainage from a tumor at a particular anatomic area. Thus, an SLN is most likely to contain any metastatic deposits. Within the past 15 years, evaluation of SLNs has become the most popular method for early staging of several malignancies, including breast carcinoma, gastrointestinal carcinoma, and melanoma. The main advantages SLN biopsy has over complete lymphadenectomy are: (1) the lower number and lesser degree of side effects and (2) the selection of a small number of lymph nodes that can then be extensively analyzed by the pathologist (through examination of hematoxylin and eosin [H&E] sections and immunohistochemistry [IHC]). Macrophages, pigmented or not, may resemble metastatic melanoma in the sentinel lymph nodes (SLN). In such cases, immunohistochemistry (IHC) is very helpful, because melanoma cells usually react with a panmelanocytic cocktail (see Immunohistochemistry) However, because this cocktail contains antibody to melanoma antigen recognized by T cells (MART)-1 (anti-MART-1) and some macrophages may express MART-1,  it may be necessary to use other, more specific markers, such as gp100 (with HMB-45), microphthalmia transcription factor (MiTF), or SOX10. As many as 20% of lymphadenectomies from the axilla or groin contain benign collections of melanocytes known as capsular or nodal nevi. The characteristic capsular location of these nevus deposits and the lack of significant cytologic atypia distinguishes them from the common subcapsular location of metastatic melanoma. Since analysis of the cytomorphologic features of such nevus cells in the lymph node is so important, it is always recommended to compare these cells with the melanoma cells in the primary lesion. A potential diagnostic pitfall is the presence of vascular metastasis in the intracapsular lymphatic vessels of the node, which mimics capsular nevi. (In the authors' experiences, it is extremely rare to detect nevus aggregates within the vessels of the SLN capsule.) 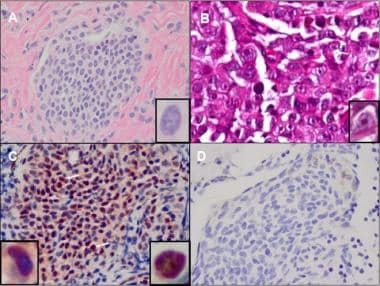 Use of IHC to label endothelial cells (CD31, CD34, or D2-40) may be helpful in detecting the rim of endothelial cells, thereby confirming the intravascular location of the cells and supporting a diagnosis of metastatic melanoma. The authors developed a homegrown cocktail that includes both anti-MART-1 and the MIB1 antibody (against Ki67). Because Ki67 is expressed in the nucleus and MART-1 in the cytoplasm, it is relatively easy to determine how many of the melanocytes (ie, cells expressing MART-1) are proliferating (ie, also expressing Ki67). Nevus cells should have a very low proliferation rate (< 1%). Identification of the sentinel lymph node (SLN) is usually achieved by means of both lymphoscintigraphy and the injection of a colored dye. On the day of the operation, before the procedure is begun, a radioactive tracer (usually labeled with technetium-99m [99m Tc]) is injected in the area of the lesion; it is then transported by the lymphatic system to a nearby lymphatic basin, where it can be detected with a Geiger counter placed above the skin. In this way, the surgeon can determine which basin or basins may harbor metastatic melanoma. During the procedure, a blue dye is also injected in the same area. The surgeon uses the Geiger counter to identify the area in the basin or basins with the highest count and then locates any SLNs that are labeled with the blue dye. The surgeon removes any blue SLN found and then rescans the area with the Geiger counter to determine if there are other lymph nodes (secondary SLNs) that are also radioactive. If secondary SLNs are found, they are removed as well. The threshold of radioactivity at which a node is considered positive may vary among institutions. For example, some use a threshold of 10 times the radioactivity of the background skin, and others use a threshold of 10% of the count of the "hottest" SLN. Lymphoscintigraphy is also useful for obtaining a precise determination of the pattern of lymphatic drainage. SLNs can be located not only in the main lymphatic basins (axilla, groin, and neck) but also, depending on the location of the primary lesion, in the elbow (epitrochlear), the knee (popliteal), the face (parotid gland), and other sites. Furthermore, some areas may drain to more than 1 basin—for example, a lesion on the midback may drain simultaneously to 1-4 different basins (axillae or groins). Imaging techniques include ultrasonography to determine if any of the lymph nodes in the basin draining the region where the melanoma is located is likely to contain metastatic deposits. Suggestive findings include enlargement and an irregular image. Sonography is becoming so precise that some protocols relay on this technique for clinical follow-up of patients with cutaneous melanoma. As mentioned earlier, the most commonly used modality is lymphoscintigraphy, in which a radioactive tracer is injected in the area of the melanoma. The tracer travels through the lymphatic system, and shortly afterward, with the aid of a Geiger counter, the area with the highest count is marked. The SLN usually underlies this area. To improve the detection of the SLN, a blue dye is also usually injected in the skin where the melanoma is. This dye will also be transferred to the nearest basin, thereby facilitating identification of the SLN (by turning the SLN blue). In general, the lymph node with the highest count will also contain blue dye, although sometimes this is not the case. The sentinel lymph node (SLN) may or may not be blue, depending on how much of the injected blue dye it contains. It should be labeled by the surgeon to indicate: (1) the anatomic source (basin), (2) whether it was "blue" or "not blue," and (3) the radioactivity count. In general, the amount of radioactivity contained in the SLN is minimal by the time it reaches the pathology laboratory. However, the institution's safety department should ensure that the technique employed permits safe processing of the SLN is safe. Most protocols discourage the use of frozen sections to evaluate SLNs. Although frozen sections may be common in SLN biopsy for other malignancies (eg, breast carcinoma), the authors do not recommend them in SLN biopsy for melanoma, for several reasons. A possible alternative technique is touch preparation cytology. [12, 13] Preparation cytology is not widely used in this setting; however, because evaluation of the specimens requires expertise in cytologic smears (melanoma cells and pigmented macrophages may be very difficult to distinguish). There is no universally accepted protocol for processing SLNs. It is obvious, however, that the classic processing used with non-SLNs—that is, bivalving the node and examining a single routine hematoxylin and eosin (H&E) slide—misses a number of small metastases. [11, 14] Consequently, other methods have been proposed, all of them involving more than one H&E slide and the possible addition of immunohistochemistry (IHC). (See Immunohistochemistry). The authors' protocol calls for 1 initial hematoxylin and eosin (H&E) slide of the breadloafed sentinel lymph node (SLN). If this slide is positive, it is reported as such; if not, the block is resubmitted to the laboratory to obtain a new H&E section slide (~200 microns deeper in the block) and 2 unstained slides. Most studies report that approximately 20% of patients with cutaneous melanoma show deposits of melanoma cells in their SLN. Metastatic melanoma cells may be epithelioid or spindled, pigmented or amelanotic, but they most commonly resemble the cells in the primary lesion. Therefore, in examining an SLN, as mentioned above, it may be very important to study the original melanoma so that the morphologic features can be compared. Such comparison is particularly essential in cases of nevoid melanoma (in which melanoma cells are small and may resemble nevus cells) and spindle cell melanoma (which may be negative for some immunohistochemical markers). It may be difficult to distinguish pigmented melanoma cells from melanophages; however, pigment granules are usually coarser and larger in macrophages than in melanoma cells. Usually, melanoma cells in the SLN are located in the subcapsular sinus as single cells, small nests, or large clusters (see the images below). Less frequently, metastases are intraparenchymal. Very rarely do melanoma cells involve the fibrous capsule; in most such cases, the phenomenon is likely secondary to involvement of intracapsular lymphatic vessels. There may be extracapsular extension into the perinodal fibroadipose tissues (< 5% of cases). A, B: Lymph node with nests of melanocytes (*) in capsule (C) and subcapsular regions (arrows). C, D: Nevus cells in capsule and subcapsular regions are positive for melanoma antigen recognized by T cells (MART)-1. A: Nests of melanocytes in the capsule of a lymph node with banal morphologic features. Nevus cells demonstrate smooth nuclear membrane and inconspicuous nucleoli (insert). B: Primary invasive melanoma with atypia of melanocytes. Melanoma cells have irregular nuclear borders and prominent nucleoli (insert). 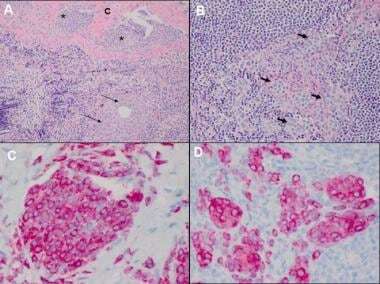 C: Evaluation of nests of melanocytes in a lymph node with double immunohistochemical slide with melanoma antigen recognized by T cells (MART)-1/Ki67. Nests of melanocytes are positive for MART-1 (red chromogen) with labeling in cytoplasm (arrows and insert). In contrast, internal control lymphocytes from germinal center show nuclear reactivity with anti-Ki67 (brown chromogen, insert). D: Nevus cells in lymph node are negative with HMB-45. The authors recommend a panmelanocytic cocktail that includes HMB-45, antibody to melanoma antigen recognized by T cells (MART)-1 (anti-MART-1), and anti-tyrosinase. In addition, because MART-1 can be expressed by macrophages,  the authors sometimes use HMB-45 by itself to help differentiate between macrophages and melanoma cells (HMB-45 usually does not label macrophages) or similarly anti-MITF or anti-SOX10, since they are relatively very specific for melanocytic differentiation. Additionally, in cases of spindle cell melanoma in which the tumor cells do not express MART-1 or gp100 (with HMB-45), the authors use anti-S100 or anti SOX10. As mentioned before, such cases will benefit by comparing the morphology of the cells in the SLN with those in the primary lesion. The majority of cutaneous melanomas spread via lymphatic vessels through the lymphatic basins. Examination of sentinel lymph nodes (SLNs) in patients with melanoma is rapidly becoming an essential component of tumor staging; as such, it is included in the current classification of the American Joint Committee on Cancer (AJCC). Furthermore, a number of current melanoma therapeutic protocols require information on SLN status to correctly stratify patients' chances of recurrence or survival. Some authors recommend measuring in the SLN the distance between the capsule and the most deeply located deposit of melanoma cells. The authors measure the tumor burden  in the SLN as determined by the size of the largest tumor deposit (in mm, 2 dimensions), the location (subcapsular vs intraparenchymal), and the presence or absence of extracapsular extension. A large, single institution, retrospective analysis of the histologic features of melanoma in 1029 SLN from 409 patients with a single primary cutaneous melanoma was completed. It demonstrated that size of tumor deposit in SLN (size >2.0 mm), extranodal extension (ENS), perilymphatic invasion (PLI), and positive nonsentinel lymph nodes in complete lymph node dissection (CLND) specimens were all independent predictors of poor disease-free survival (DFS). When controlled for CLND status, SLN tumor deposit (size >10.0 mm) and ENS were independent predictors of distant metastasis-free survival (DMFS). SLN with ENS and PLI were independent predictors of melanoma specific survival (MSS). The authors are currently analyzing a larger series to determine whether such a stratification scheme provides clinically significant prognostic information. Increased angiogenesis in the SLN-positive patient appears to be associated with a higher incidence of additional positive lymph nodes. With regard to the relation between tumor size and prognosis, patients with smaller melanoma metastases to the SLN have a better prognosis than those with larger metastases; however, most data indicate that there is not a definite cut-off in the size of the metastatic deposits. Furthermore, the authors have seen rare cases in which only a single melanoma cell was identified in the SLN, but multiple distant metastases subsequently developed within 4 years of diagnosis. In addition to SLN positivity and nodal status (N category) in the TNM staging system for melanoma, lymph node ratio (LNR) has been reported to be an independent predictor of disease-specific survival. LNR or N-ratio is defined as the ratio between metastatic and examined lymph nodes from a radical lymph node dissection (RLND). The authors retrospectively analyzed 8,177 patients with cutaneous melanoma who had a minimum of 5 lymph nodes histologically examined. The risk of melanoma-related death (hazard ratio) was found to increase by 2% for each percentage unit of LNR increase. Furthermore, when LNR values were categorized into intervals of 10 percentage units, there was a 10-fold increased risk of melanoma-related deaths. The prognostic value of LNR was further demonstrated in a subgroup of patients with 10 or more lymph nodes examined, as well as in patients with stage III disease. Since LNR is dependent on the number of lymph nodes examined, the authors demonstrated LNR with ≥ 5 and ≥ 10 lymph nodes. Both appear to have equal predictive power of disease-specific specific survival. LNR may provide additional information for risk stratification in patients with cutaneous melanoma. Some studies have indicated that detection of melanocytic mRNA by polymerase chain reaction (PCR) analysis in SLNs correlates with decreased survival [51, 52, 53] ; however, not all authors agree with this finding. [54, 55] A possible explanation for this discrepancy may be the presence of nevus cells in some SLNs; clearly, those cells also contain melanocytic mRNA and thus would result in positive PCR results. Therefore, to institute PCR analysis for SLNs in melanoma, it may be necessary to discover mRNA specific for melanoma cells. Kachare SD, Singla P, Vohra NA, Zervos EE, Wong JH, Fitzgerald TL. Sentinel lymph node biopsy is prognostic but not therapeutic for thick melanoma. Surgery. 2015 Sep. 158(3):662-8. [Medline]. Faries MB, Cochran AJ, Elashoff RM, Thompson JF. Multicenter Selective Lymphadenectomy Trial-I confirms the central role of sentinel node biopsy in contemporary melanoma management: response to 'No survival benefit for patients with melanoma undergoing sentinel lymph node biopsy: critical appraisal of the Multicenter Selective Lymphadenectomy Trial-I final report'. Br J Dermatol. 2015 Mar. 172(3):571-3. [Medline]. Balch CM, Gershenwald JE, Soong SJ, et al. Final version of 2009 AJCC melanoma staging and classification. J Clin Oncol. 2009 Dec 20. 27(36):6199-206. [Medline]. [Full Text]. Ribero S, Gualano MR, Osella-Abate S, et al. Association of histologic regression in primary melanoma with sentinel lymph node status: a systematic review and meta-analysis. JAMA Dermatol. 2015 Dec 1. 151(12):1301-7. [Medline]. Pawlik TM, Ross MI, Prieto VG, et al. Assessment of the role of sentinel lymph node biopsy for primary cutaneous desmoplastic melanoma. Cancer. 2006 Feb 15. 106(4):900-6. [Medline]. Broer PN, Walker ME, Goldberg C, et al. Desmoplastic melanoma: a 12-year experience with sentinel lymph node biopsy. Eur J Surg Oncol. 2013 Jul. 39(7):681-5. [Medline]. Trejo O, Reed JA, Prieto VG. Atypical cells in human cutaneous re-excision scars for melanoma express p75NGFR, C56/N-CAM and GAP-43: evidence of early Schwann cell differentiation. J Cutan Pathol. 2002 Aug. 29(7):397-406. [Medline]. Carson KF, Wen DR, Li PX, et al. Nodal nevi and cutaneous melanomas. Am J Surg Pathol. 1996 Jul. 20(7):834-40. [Medline]. Lohmann CM, Iversen K, Jungbluth AA, Berwick M, Busam KJ. Expression of melanocyte differentiation antigens and ki-67 in nodal nevi and comparison of ki-67 expression with metastatic melanoma. Am J Surg Pathol. 2002 Oct. 26(10):1351-7. [Medline]. Biddle DA, Evans HL, Kemp BL, et al. Intraparenchymal nevus cell aggregates in lymph nodes: a possible diagnostic pitfall with malignant melanoma and carcinoma. Am J Surg Pathol. 2003 May. 27(5):673-81. [Medline]. Prieto VG. Use of frozen sections in the examination of sentinel lymph nodes in patients with melanoma. Semin Diagn Pathol. 2008 May. 25(2):112-5. [Medline]. Messina JL, Glass LF, Cruse CW, Berman C, Ku NK, Reintgen DS. Pathologic examination of the sentinel lymph node in malignant melanoma. Am J Surg Pathol. 1999 Jun. 23(6):686-90. [Medline]. Creager AJ, Shiver SA, Shen P, Geisinger KR, Levine EA. Intraoperative evaluation of sentinel lymph nodes for metastatic melanoma by imprint cytology. Cancer. 2002 Jun 1. 94(11):3016-22. [Medline]. Gershenwald JE, Colome MI, Lee JE, et al. Patterns of recurrence following a negative sentinel lymph node biopsy in 243 patients with stage I or II melanoma. J Clin Oncol. 1998 Jun. 16(6):2253-60. [Medline]. Batistatou A, Cook MG, Massi D, and the ESP Dermatopathology Working Group. Histopathology report of cutaneous melanoma and sentinel lymph node in Europe: a web-based survey by the Dermatopathology Working Group of the European Society of Pathology. Virchows Arch. 2009 May. 454(5):505-11. [Medline]. Cochran AJ. Surgical pathology remains pivotal in the evaluation of 'sentinel' lymph nodes. Am J Surg Pathol. 1999 Oct. 23(10):1169-72. [Medline]. Prieto VG, Clark SH. Processing of sentinel lymph nodes for detection of metastatic melanoma. Ann Diagn Pathol. 2002 Aug. 6(4):257-64. [Medline]. McMasters KM, Egger ME, Edwards MJ, et al. Final results of the Sunbelt Melanoma Trial: a multi-institutional prospective randomized phase III study evaluating the role of adjuvant high-dose interferon alfa-2b and completion lymph node dissection for patients staged by sentinel lymph node biopsy. J Clin Oncol. 2016 Apr 1. 34(10):1079-86. [Medline]. Shidham VB, Qi DY, Acker S, et al. Evaluation of micrometastases in sentinel lymph nodes of cutaneous melanoma: higher diagnostic accuracy with Melan-A and MART-1 compared with S-100 protein and HMB-45. Am J Surg Pathol. 2001 Aug. 25(8):1039-46. [Medline]. Abrahamsen HN, Hamilton-Dutoit SJ, Larsen J, Steiniche T. Sentinel lymph nodes in malignant melanoma: extended histopathologic evaluation improves diagnostic precision. Cancer. 2004 Apr 15. 100(8):1683-91. [Medline]. Hutchens KA, Heyna R 2nd, Mudaliar K, Wojcik E. The new AJCC guidelines in practice: utility of the MITF immunohistochemical stain in the evaluation of single-cell metastasis in melanoma sentinel lymph nodes. Am J Surg Pathol. 2013 Jun. 37(6):933-7. [Medline]. Shidham VB, Qi D, Rao RN, et al. Improved immunohistochemical evaluation of micrometastases in sentinel lymph nodes of cutaneous melanoma with 'MCW melanoma cocktail'--a mixture of monoclonal antibodies to MART-1, Melan-A, and tyrosinase. BMC Cancer. 2003 May 7. 3:15. [Medline]. [Full Text]. Cascinelli N, Belli F, Santinami M, et al. Sentinel lymph node biopsy in cutaneous melanoma: the WHO Melanoma Program experience. Ann Surg Oncol. 2000 Jul. 7(6):469-74. [Medline]. Gershenwald JE, Thompson W, Mansfield PF, et al. Multi-institutional melanoma lymphatic mapping experience: the prognostic value of sentinel lymph node status in 612 stage I or II melanoma patients. J Clin Oncol. 1999 Mar. 17(3):976-83. [Medline]. Rousseau DL Jr, Ross MI, Johnson MM, et al. Revised American Joint Committee on Cancer staging criteria accurately predict sentinel lymph node positivity in clinically node-negative melanoma patients. Ann Surg Oncol. 2003 Jun. 10(5):569-74. [Medline]. Topping A, Dewar D, Rose V, et al. Five years of sentinel node biopsy for melanoma: the St George's Melanoma Unit experience. Br J Plast Surg. 2004 Mar. 57(2):97-104. [Medline]. van der Ploeg AP, van Akkooi AC, Haydu LE, et al. The prognostic significance of sentinel node tumour burden in melanoma patients: an international, multicenter study of 1539 sentinel node-positive melanoma patients. Eur J Cancer. 2014 Jan. 50(1):111-20. [Medline]. Frankel TL, Griffith KA, Lowe L, et al. Do micromorphometric features of metastatic deposits within sentinel nodes predict nonsentinel lymph node involvement in melanoma?. Ann Surg Oncol. 2008 Sep. 15(9):2403-11. [Medline]. Page AJ, Carlson GW, Delman KA, Murray D, Hestley A, Cohen C. Prediction of nonsentinel lymph node involvement in patients with a positive sentinel lymph node in malignant melanoma. Am Surg. 2007 Jul. 73(7):674-8; discussion 678-9. [Medline]. Debarbieux S, Duru G, Dalle S, Beatrix O, Balme B, Thomas L. Sentinel lymph node biopsy in melanoma: a micromorphometric study relating to prognosis and completion lymph node dissection. Br J Dermatol. 2007 Jul. 157(1):58-67. [Medline]. Sabel MS, Griffith K, Sondak VK, et al. Predictors of nonsentinel lymph node positivity in patients with a positive sentinel node for melanoma. J Am Coll Surg. 2005 Jul. 201(1):37-47. [Medline]. Gershenwald JE, Andtbacka RH, Prieto VG, et al. Microscopic tumor burden in sentinel lymph nodes predicts synchronous nonsentinel lymph node involvement in patients with melanoma. J Clin Oncol. 2008 Sep 10. 26(26):4296-303. [Medline]. [Full Text]. Guggenheim M, Dummer R, Jung FJ, et al. The influence of sentinel lymph node tumour burden on additional lymph node involvement and disease-free survival in cutaneous melanoma--a retrospective analysis of 392 cases. Br J Cancer. 2008 Jun 17. 98(12):1922-8. [Medline]. [Full Text]. Dewar DJ, Newell B, Green MA, Topping AP, Powell BW, Cook MG. The microanatomic location of metastatic melanoma in sentinel lymph nodes predicts nonsentinel lymph node involvement. J Clin Oncol. 2004 Aug 15. 22(16):3345-9. [Medline]. Rossi CR, De Salvo GL, Bonandini E, et al. Factors predictive of nonsentinel lymph node involvement and clinical outcome in melanoma patients with metastatic sentinel lymph node. Ann Surg Oncol. 2008 Apr. 15(4):1202-10. [Medline]. van Akkooi AC, Bouwhuis MG, de Wilt JH, Kliffen M, Schmitz PI, Eggermont AM. Multivariable analysis comparing outcome after sentinel node biopsy or therapeutic lymph node dissection in patients with melanoma. Br J Surg. 2007 Oct. 94(10):1293-9. [Medline]. Wright BE, Scheri RP, Ye X, et al. Importance of sentinel lymph node biopsy in patients with thin melanoma. Arch Surg. 2008 Sep. 143(9):892-9; discussion 899-900. [Medline]. [Full Text]. Guggenheim MM, Hug U, Jung FJ, et al. Morbidity and recurrence after completion lymph node dissection following sentinel lymph node biopsy in cutaneous malignant melanoma. Ann Surg. 2008 Apr. 247(4):687-93. [Medline]. Satzger I, Volker B, Al Ghazal M, Meier A, Kapp A, Gutzmer R. Prognostic significance of histopathological parameters in sentinel nodes of melanoma patients. Histopathology. 2007 May. 50(6):764-72. [Medline]. Gyorki DE, Sanelli A, Herschtal A, et al. Sentinel lymph node biopsy in T4 melanoma: an important risk-stratification tool. Ann Surg Oncol. 2016 Feb. 23(2):579-84. [Medline]. Hunger RE, Michel A, Seyed Jafari SM, Shafighi M. Sentinel lymph node biopsy in thick malignant melanoma: A 16-year single unit experience. Eur J Dermatol. 2015 Oct 1. 25(5):472-6. [Medline]. Paradela S, Fonseca E, Pita-Fernandez S, et al. Prognostic factors for melanoma in children and adolescents: a clinicopathologic, single-center study of 137 patients. Cancer. 2010 Sep 15. 116(18):4334-44. [Medline]. Kim J, Sun Z, Gulack BC, et al. Sentinel lymph node biopsy is a prognostic measure in pediatric melanoma. J Pediatr Surg. 2016 Jun. 51(6):986-90. [Medline]. Prieto VG, Diwan AD, Lazar AJ, Johnson MM, Shacherer C, Gershenwald J. Histologic quantification of tumor size in sentinel lymph node metastases correlates with prognosis in patients with cutaneous malignant melanoma [abstract]. Mod Pathol. 2006. 19:87A. Murali R, Desilva C, Thompson JF, Scolyer RA. Factors predicting recurrence and survival in sentinel lymph node-positive melanoma patients. Ann Surg. 2011 Jun. 253(6):1155-64. [Medline]. Prieto VG. Sentinel lymph nodes in cutaneous melanoma. Surg Pathol Clin. 2009 Sep. 2(3):553-63. [Medline]. Pastushenko I, Van den Eynden GG, Vicente-Arregui S, et al. Increased angiogenesis and lymphangiogenesis in metastatic sentinel lymph nodes is associated with nonsentinel lymph node involvement and distant metastasis in patients with melanoma. Am J Dermatopathol. 2016 May. 38(5):338-46. [Medline]. Mocellin S, Pasquali S, Riccardo Rossi C, Nitti D. Validation of the prognostic value of lymph node ratio in patients with cutaneous melanoma: A population-based study of 8,177 cases. Surgery. 2011 Jul. 150(1):83-90. [Medline]. Nagaraja V, Eslick GD. Is complete lymph node dissection after a positive sentinel lymph node biopsy for cutaneous melanoma always necessary? A meta-analysis. Eur J Surg Oncol. 2013 Jul. 39(7):669-80. [Medline]. Leiter U, Stadler R, Mauch C, et al, for the German Dermatologic Cooperative Oncology Group (DeCOG). Complete lymph node dissection versus no dissection in patients with sentinel lymph node biopsy positive melanoma (DeCOG-SLT): a multicentre, randomised, phase 3 trial. Lancet Oncol. 2016 Jun. 17(6):757-67. [Medline]. Romanini A, Manca G, Pellegrino D, et al. Molecular staging of the sentinel lymph node in melanoma patients: correlation with clinical outcome. Ann Oncol. 2005 Nov. 16(11):1832-40. [Medline]. Gradilone A, Ribuffo D, Silvestri I, et al. Detection of melanoma cells in sentinel lymph nodes by reverse transcriptase-polymerase chain reaction: prognostic significance. Ann Surg Oncol. 2004 Nov. 11(11):983-7. [Medline]. Mocellin S, Hoon DS, Pilati P, Rossi CR, Nitti D. Sentinel lymph node molecular ultrastaging in patients with melanoma: a systematic review and meta-analysis of prognosis. J Clin Oncol. 2007 Apr 20. 25(12):1588-95. [Medline]. Scoggins CR, Ross MI, Reintgen DS, et al. Prospective multi-institutional study of reverse transcriptase polymerase chain reaction for molecular staging of melanoma. J Clin Oncol. 2006 Jun 20. 24(18):2849-57. [Medline]. Hershko DD, Robb BW, Lowy AM, et al. Sentinel lymph node biopsy in thin melanoma patients. J Surg Oncol. 2006 Mar 15. 93(4):279-85. [Medline]. Scheier BY, Lao CD, Kidwell KM, Redman BG. Use of preoperative PET/CT staging in sentinel lymph node-positive melanoma. JAMA Oncol. 2016 Jan. 2(1):136-7. [Medline]. Boggs W. Preop PET/CT staging of questionable value in sentinel lymph node-positive melanoma. Reuters Health Information. Available at http://www.medscape.com/viewarticle/852106. October 06, 2015; Accessed: December 16, 2015.